National Philanthropy Day (NPD) and the Awards luncheon celebrates the spirit of philanthropy in our local community, while bringing forward great stories of generosity, selflessness, and recognizes unsung heroes helping to make Hawaii thrive. We invite you to nominate local visionaries, an individual or an organization, for one of the nine categories for consideration. Awardees will be recognized on November 13, 2019, at the Sheraton Waikiki. Help us find and honor these outstanding individuals and organizations by completing a nomination form TODAY! 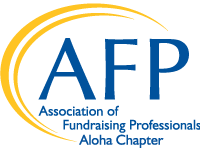 Completed nomination forms may be sent to Chapter Administrator, Susan Oshiro: admin@afphawaii.org. Deadline for nominations is May 31, 2019.